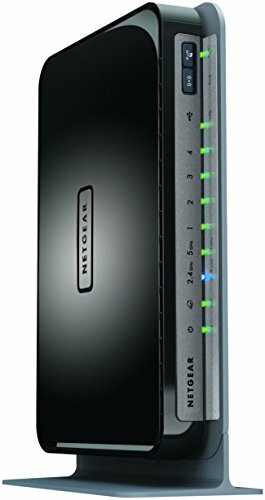 The NETGEAR N750 Wireless Dual Band Gigabit Router-Premium Edition offers high-performance wireless speeds up to 300+450 Mbps and with simultaneous dual band technology avoids interference, ensuring top WiFi speeds and reliable connections. It supports a wide range of new features and applications such as ReadySHAREamp;reg; Cloud, ReadySHAREamp;reg; Printer, and is Time Machineamp;reg; compatible to create a powerful home network for applications such as streaming HD video and multi-player gaming. Improved wireless range delivers better connections for medium to large homes and multiple devices, while four Gigabit Ethernet ports offer ultra-fast wired connections. USB port enables faster USB access speeds for wireless connections to external hard drives and printers.